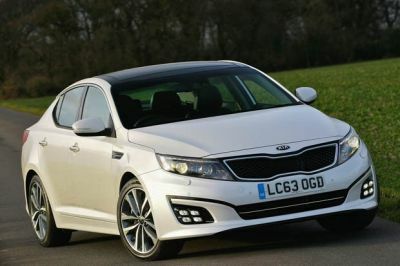 Kia’s publicity slogan is 'The Power to Surprise' and I must admit that it rang true when I recently encountered their executive saloon class Optima. This is a very generous sized, spacious five-seat saloon, as stylish as they come and certainly worthy of consideration for those motorists wanting a lot of executive class car for their money. The rapidly growing Kia brand is better known for its iconic Sportage SUV, some very competent compact hatch backs and the well appointed Sorento 7-seat MPV plus a bench-mark 7-year/100,000-mile warranty. 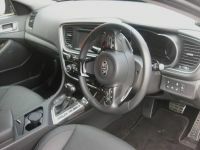 I must admit that the Optima came as a surprise to me, more so when I found that the test example was powered by a mere 1.7-litre turbo diesel engine driving through a 6-speed automatic gearbox. Kia has with a more limited engine range than some major manufacturers but what they have are really up to date units and certainly power efficient. Thus this relatively small capacity power unit in a car with dimensions about the same as a Jaguar XF (but with, in my view, much more interior space) proved surprisingly lively, the engine developing a competitive 134 bhp with good flexibility and working well with the appropriately chosen ratios in the auto box. Those more discerning drivers can also 'play' with the paddle shift gear selector controls if they want even brisker gear changes. Most of my driving was carried out on a specialist automotive test track which enabled a good check of the slow speed pick-up and the cruising ability at speeds not legal on open roads and the handling competence. Kia claim the Optima would top out at 122 mph and reach 60 mph from rest in 11.5 seconds and I don’t think that is an idle boast. Importantly, the performance is achieved in a refined and quiet manner, very little mechanical noise and hardly a murmur of wind or noise from the medium profile tyres. A power/memory adjustable driving seat is of generous dimensions and with good support in all directions allowing for a comfortable 'with it' driving position. That comfort enabled me to exploit what proved to be good grippy handling on the tighter bends and excellent straight line high-speed stability. Steering action is light yet very responsive, the brakes also light on feel but strong on stopping power and the ride, though a touch on the soft side, was not bouncy and dealt with rougher surfaces with ease. An automatic electric parking brake makes for easy slope starts. An official Combined fuel consumption figure of 47.1 mpg is probably optimistic considering the power to weight ratio and the Urban figure of a quoted 35.8 mpg is probably closer to what is realistic and that is good for what this car can do. 158 g/km emissions puts the Optima into Band D for VED at £110 per year. Undoubtedly the real surprise is the high standard of build quality and interior finish plus all the serious kit that the Optima provides. Firstly, that fascia is a class act with good and extensive instrumentation and supplementary information and a touch of classy wood grain trim. The seats (heated at the front) are leather upholstered and there is plenty of bright metal effect interior embellishment and shiny polycarbonate plus a leather covered steering wheel and gear selector knob – perhaps not quite up to a premium brand standard but getting very close. It is hard to find any omissions in the equipment specification – tinted glass, automatic levelling Xenon headlights, parallel park system, rear ventilation controls, 7 inch touch screen rear view camera/satellite navigation system, the usual connectivity with voice operated Bluetooth, reversing sensors and a full size spare alloy wheel would you believe? Kia Optima ? What a surprise! MAIN RIVALS: Vauxhall Insignia, Ford Mondeo, Peugeot 508, DS5, MG6, Skoda Superb, VW Passat.